This tutorial provides you with a foundation for working with the Adobe Photoshop workspace. It is the first lesson in the Adobe Photoshop CS6 Digital Classroom book. For more Adobe Photoshop training options, visit AGI’s Photoshop Classes. 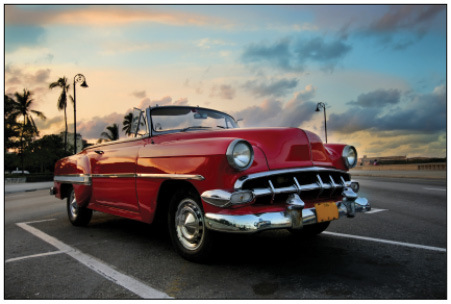 In this lesson, you are offered the opportunity to dive right into Adobe Photoshop CS5 and put together an exciting composition. This lesson was created to help current users (or fast learners) quickly discover some of the hottest new features in Photoshop CS5. Adobe Photoshop is an image-editing program that can open an image captured by a scanner or digital camera, or downloaded from the Web. It can also open captured video images and vector illustrations. In addition, you can create new documents in Photoshop, including vector graphics, which are scalable image files (for example, the images can be enlarged or reduced in size with no loss of clarity). Before starting, make sure that your tools and panels are consistent by resetting your preferences. See “Resetting Adobe Photoshop CS6 preferences” in the Starting up section of this book. You will work with several files from the ps02lessons folder in this lesson. These lesson files are available when you purchase the Photoshop CS6 Digital Classroom book. You can still follow along with your own images for this sample tutorial, as it primarily covers general Photoshop CS6 techniques. Mini Bridge works like the stand-alone Adobe Bridge application, but resides in Photoshop. You can access Mini Bridge by using the File menu, or by selecting Window > Extensions > Mini Bridge. 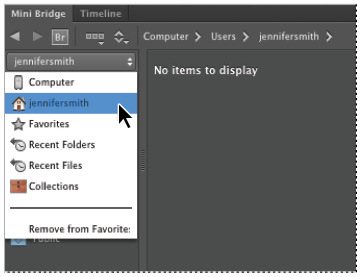 1 Launch Adobe Photoshop CS6 and choose File > Browse in Mini Bridge or Window > Extensions > Mini Bridge; Mini Bridge appears as a panel across the bottom of the workspace. If a message displays indicating that you must launch Bridge CS6, press Launch Bridge. Even though you will be instructed to use Adobe Bridge throughout the lessons in this book, you can also choose to use Mini Bridge. 2 Click on Favorites and select your User Name from the drop-down menu in the navigation pod on the left side of Mini Bridge. You now see personal folders that you can navigate to, such as Desktop, Documents, and Pictures. 3 Double-click on Desktop to see the folders on your desktop appear in the Navigation pod, including the pslessons folder that you downloaded. If you do not see your folder on the Desktop, verify that you didn’t save your folder to the Desktop of another User. Select your user name to see the desktop folder, if it is not immediately visible. 4 Double-click the pslessons folder to reveal the contents, and then click ps02lessons. The Mini Bridge now displays three images of an antique car in the folder. As you practice with the files throughout this book, you will find that you are instructed to save a work file immediately after opening the original file. 5 Open the file named ps0201.psd, which is the starting file used for this lesson. Choose File > Save As to open the Save as dialog box. 6 Navigate to the ps02lessons folder. In the File name textbox, type ps0201_work, and choose Photoshop from the Format drop-down menu. Click Save.